Office parties... good or bad? Having worked in many different types of companies over the years, the team at eho chef have lots of different experiences of Christmas parties from the sit-down dinners to the rowdy drunken pub nights, to a buffet in the office to a supplier's party with entertainment thrown in for good measure! Great memories come flooding back of advertising agency dinners at restaurants such as 'Langan's Brasserie' to riverboat discos in January because December is far too busy for retail organisations to hold a party! * In-office parties - are they lunchtime or after work? Could a chef come and do the food on-site? This would take the pressure away from the Office Manager having to nip to Marks & Spencer to get plates of sandwiches and nibbles! * Lunch out parties - do you go to the usual office lunch haunt or do you go somewhere a little bit different for a Christmas treat? Do you book the set menu or can everyone choose whatever they want? * After work parties - does everyone get changed in the office or do you just rock up in work gear these days? Do you go out eating or drinking? Do you end up in a nightclub? * Saturday night parties - do these still happen? Traditionally, central London based companies would host a party on a Thursday night so that their employees didn't have to travel to London on a weekend. Do the directors arrange and pay for the party? Is there a budget? 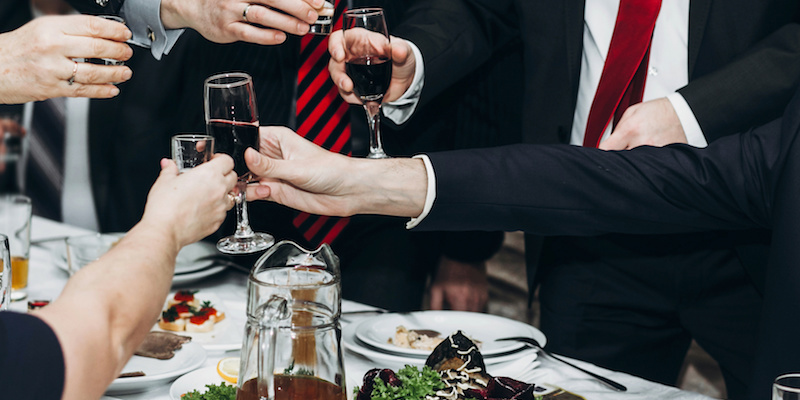 Did you know that all companies can spend a certain amount on a Christmas party annually as long as everyone is invited - according to an accountant we know, it's then tax-deductible for the company. We have many chefs who could cater for an event in your office or at a 'dry' venue, so be sure to get in touch if we can help you in any way - give Linda a call on 0207 183 1628 if you've got any questions!